A quick trip to the Laura Mercier counter during the Neiman Marcus beauty event proved interesting last week. I already own two fragrances from the line: Tarte Au Citron and Eau de Lune, both of which I find interesting and somewhat unique. Eau de Lune has quickly become a go-to daytime fragrance and Tarte Au Citron will always remind me of my favorite dessert. The first new offering is an addition to her Eau De Parfum line, which currently includes Eau de Lune and L'Heure Magique. The new scent is Neroli, a refreshing, seaside take on orange blossom and one that certainly will find its way into many collections with a nifty $65 price point. I am anxiously awaiting the day the body lotion and cream in this scent will appear, for the spritzed fragrance lasts only a few hours on my skin. However, while it is there, it is delightfully fresh and sweet, faintly reminding me of the orange blossoms I smell in my neighborhood during my springtime nightly walk. The second is Violette, an addition to the Body & Bath Eau Gourmande line. Laura Mercier suggests layering the various scents available in this line such as Vanille Gourmande, Almond Coconut and Creme Brulee. As you would guess by the name and the others in the line, Violette is a very sweet, candied violet that despite being an eau de toilette has great staying power. I purchased this one on the spot for an inexpensive addition to my spring fragrance wardrobe. I foresee layering it with the Vanille Gourmande lotion for a lighthearted, weekend fragrance. Your lucky the Neroli worked on you, because it became a scrubber on me, it was like gasoline mixed with sweet tarts. Sigh, still looking for a good Neroli scent. Oh, that stinks! (Literally!) Gasoline mixed with sweet tarts is not quite what we're looking for, eh? I'm sorry to hear it didn't work for you. Have you tried L'Artisan's 2007 Orange Blossom? I think that is my favorite Orange Blossom but the price point is prohibitive. You could always buy a sample from Perfumed Court to test? I've tried L'artisan's Orange Blossom and well although beautiful it just isn't quite what I am looking for. But there is nothing quite as fun as a quest. That's for sure! 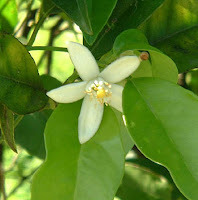 The quest to find the perfect Orange Blossom scent should be fun. I also like Jo Malone's and I love SL Fleurs de Citronniers, although the latter is lemon blossoms instead of orange. Let me know what you find! No better Orange Blossom scent than Jo Malone.